We took the scenic route from Bremerhaven to Bremen, which is a commercial and industrial city with a port on the River Weser. We had an official welcome at midday, followed by lunch and a tour of the city. It is a major cultural and economic hub and is home to dozens of historical galleries and museums, as well as the University of Bremen. Bremen is also home to a large number of multinational companies and manufacturing centers. 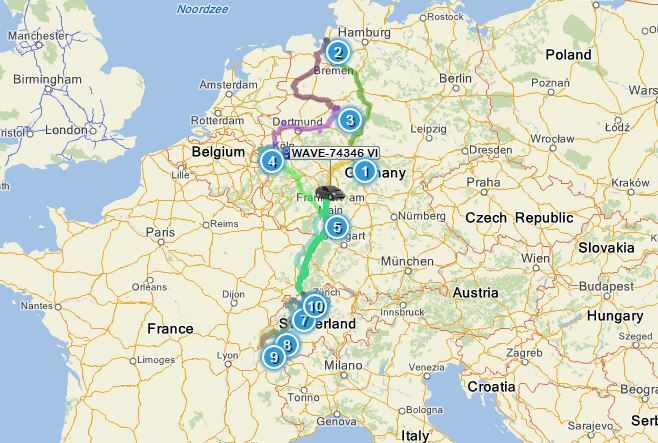 The WAVE then surged on to Lingen, which is known for its beautiful natural setting alongside the River Ems. It is also known for its nuclear industry and for its University of Applied Sciences. 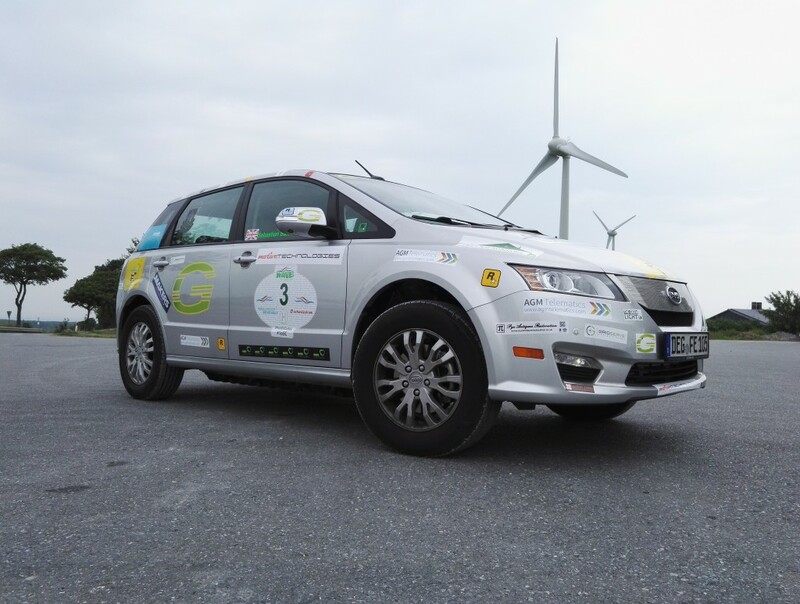 We then traveled to the Energy Park at Dörentrup, where we stayed for the night. We had an official welcome and a briefing at the Innovation Centre. Pictures of all the vehicles in the WAVE were taken at the Solar Port. To our surprise at 11 pm all the street lights turned off and we had to request that lights be turned back on as needed by sending a code to a special phone number called Dial4light. This is intended to reduce energy use, save money, respect the nocturnal fauna and avoid light pollution. Gordon Foat interviews Jutta Kleinschmidt, the only woman to win the Dakar Rally. En route to Warstein we passed the Hermann Monument, from which there is a spectacular view of the area. Warstein is in a largely forested area with the Haarstrang mountain to the north. We had an official welcome at 10.30 followed by a tour. The most well known employer is the Warsteiner Brauerei which is famous all over the world. We were delighted with the vast spaces of the park, where we saw a variety of wild animals. We then drove on to Dorsten and arrived in time for lunch, which was followed by an official reception and guided tour of the City. While Dorsten’s old town has many historical castles, just south of the town the Ruhr region begins, Germany’s largest urban agglomeration. Archaeological findings show that the area was already populated during the Neolithic and Bronze Ages, from about 4000 BC onwards. The region is committed to supporting the government’s environmental programme. The German government and the nuclear power industry agreed to phase out all nuclear power plants by 2021. It also enforces energy conservation, green technologies, emission reduction activities, and aims to meet the country’s electricity demands using 40% renewable sources by 2020. Germany is committed to the Kyoto protocol and several other treaties promoting biodiversity, low emission standards, water management, and the commercialization of renewable energy. The country’s household recycling rate is among the highest in the world — at around 65%. The German energy transition (Energiewende) is the recognised move to a sustainable economy by means of energy efficiency and renewable energy. We had an official welcome in Heinsberg where we stayed for the night. It is situated near the border with the Netherlands with two rivers flowing through, the Wurm and the Rur. There are many well known companies in the industrial area. From Heinsberg we drove to Remagen, which is situated on the bank of the River Rhine. Remagen has many beautiful and well-maintained churches, castles and monuments. The Apollinariskirche is a church on the site of a Roman temple on a hill above the town. We spent the morning in Remagen and then the WAVE flowed on to Bingen, which forms the southern limit of the UNESCO Rhine Gorge World Heritage Site. This week there is an exhibition showing the biodiversity of butterflies and moths and their habitats which are worth protecting. We drove to Mannheim for the evening, which is located at the confluence of the Rhine and the Neckar. The eighteenth century Mannheim Palace now houses the University of Mannheim. The city is home to many well-known companies. Mannheim is a member of the UNESCO Creative Cities Network and the city’s electrical grid is installed with a Power-line communication network. One bus route in Mannheim will be totally electrically operated. As a part of the “mv-primove” research project, two electrically-powered buses which are re-charged cable-free at their bus stops, will be tested and further developed until they are ready for market. 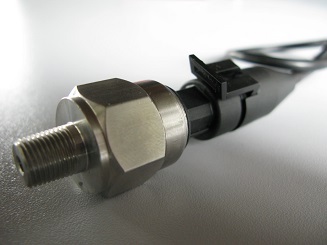 This has been made possible by a contact-free inductive recharging technique developed by Bombardier in Mannheim. “The buses are recharged in a couple of seconds”, explained First Mayor Christian Specht, who represents Mannheim in the Eurocities Mobility Forum. 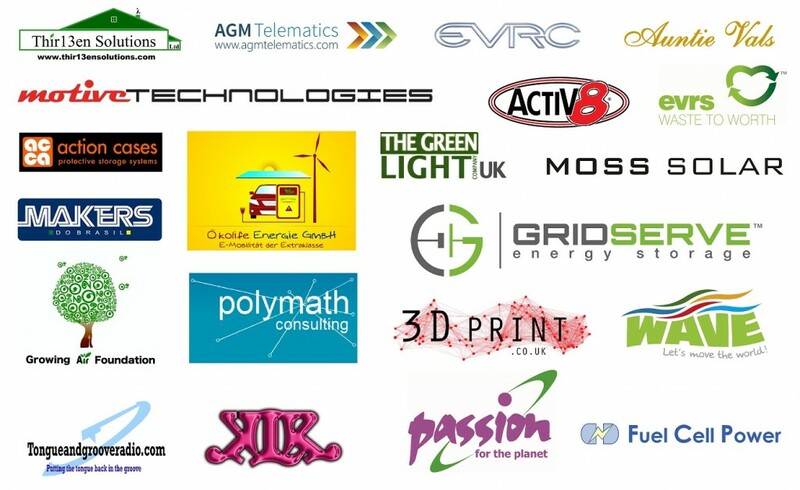 The development of electric vehicles in the UK is supported by many small innovative companies which are sponsoring Team UK’s participation in the WAVE. We crossed the border from Germany to France in order to visit Selestat, which is a commune in the north-east region of France, not far from the Rhine. The city has a thousand years of history with many remarkable remains including magnificent churches and Renaissance and 18th century residences. The people of Sélestat believe that the global agreement on climate change reached in Paris must also be accompanied by practical measures at local level. Sélestat’s contribution is the efficient use of natural resources and promoting low-carbon transport and economic development. The next stop was back in Germany at the municipality of Ihringen, which is renowned for its wine. We then crossed the border into Switzerland and spent the night in Pratteln which is located at the foot of Mt. Adlerberg. Pratteln has expanded down into the Rhine valley, with a new settlement and industrial development. 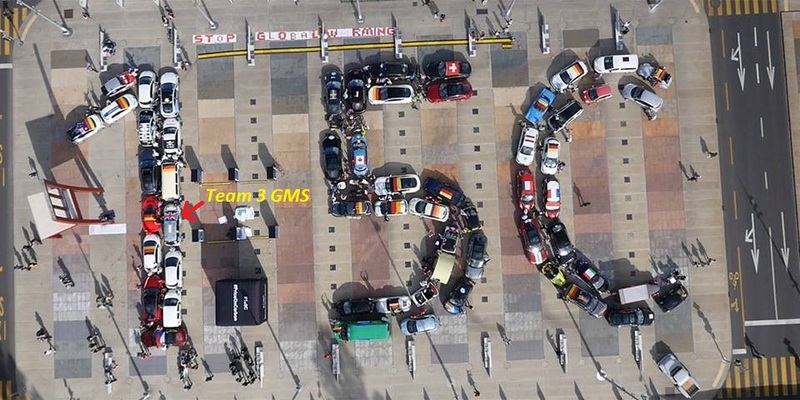 The WAVE then split into streams of 20 vehicles, which visited schools in Switzerland. Liestal is south of Basel in Switzerland. It is an industrial town with an interesting cobbled-street old town. We had an official welcome at the Berufsschule at Liestal which was attended by 200 schoolchildren. 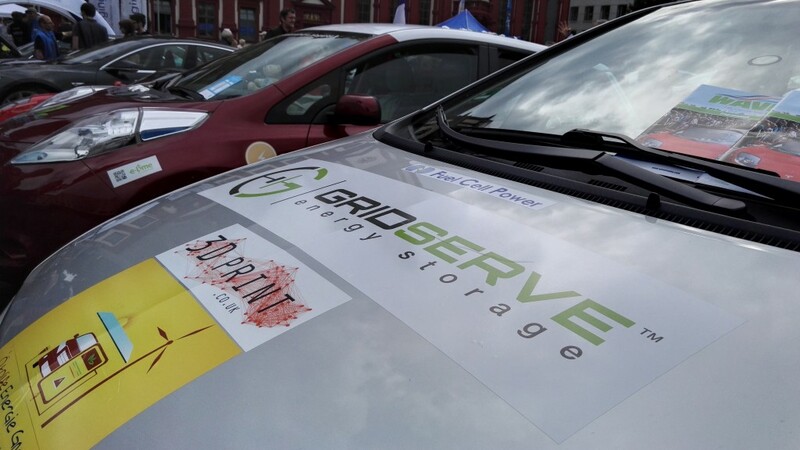 Another WAVE stream visited the school in the Municipality of Roggwil, where we showed our electric vehicles to 100 children. 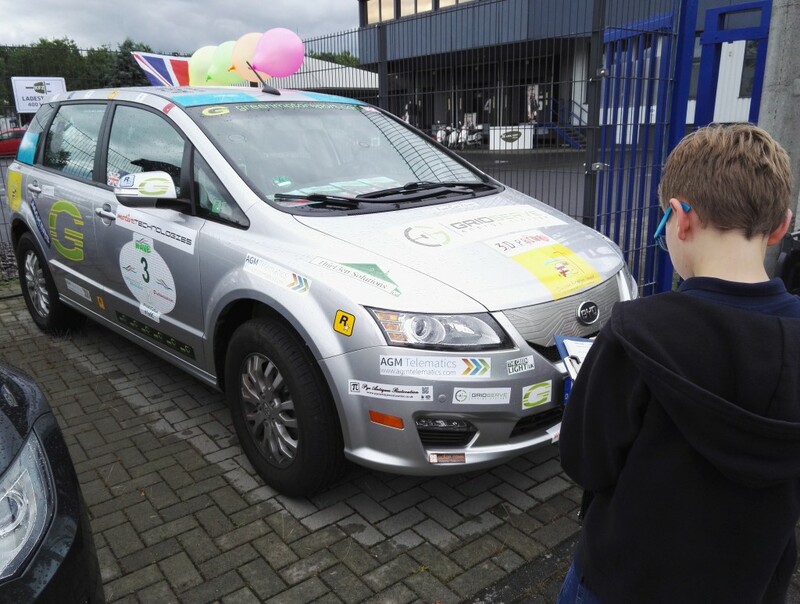 The third stream went to Kleindietwil where the children were excited by our electric vehicles powered by renewable energy. The fourth stream visited a school in the Municipality of Huttwil which is listed in the Swiss Heritage Inventory. We were greeted by 100 children who were thrilled that we would enable them to drive all types of clean, economic vehicles. The WAVE streams rejoined at Choindez, which is a hamlet in the canton of Jura. We were greeted with an official reception followed by a guided tour. During the afternoon we all surged on to the Tissot Arena in Biel where we stayed for the night. Biel lies at the foot of the first mountain range of the Jura Mountains area. The precision engineering expertise available in Biel/Bienne forms the basis for several high-tech industries, including the automotive industry and telecommunication. After an excellent dinner we had an official reception and briefing. The WAVE split into two streams to visit schools on our way to Bern. We had a great welcome from 200 children in Nidau Burgerbeunden and 100 more in Wohlen. The city of Bern (Berne) is the capital of Switzerland and is home to over a hundred Swiss heritage sites of national significance. The entire Old Town is a UNESCO World Heritage Site. There was an official welcome for the WAVE and we showed how we could make their wonderful city clean and quiet with zero emission electric vehicles. 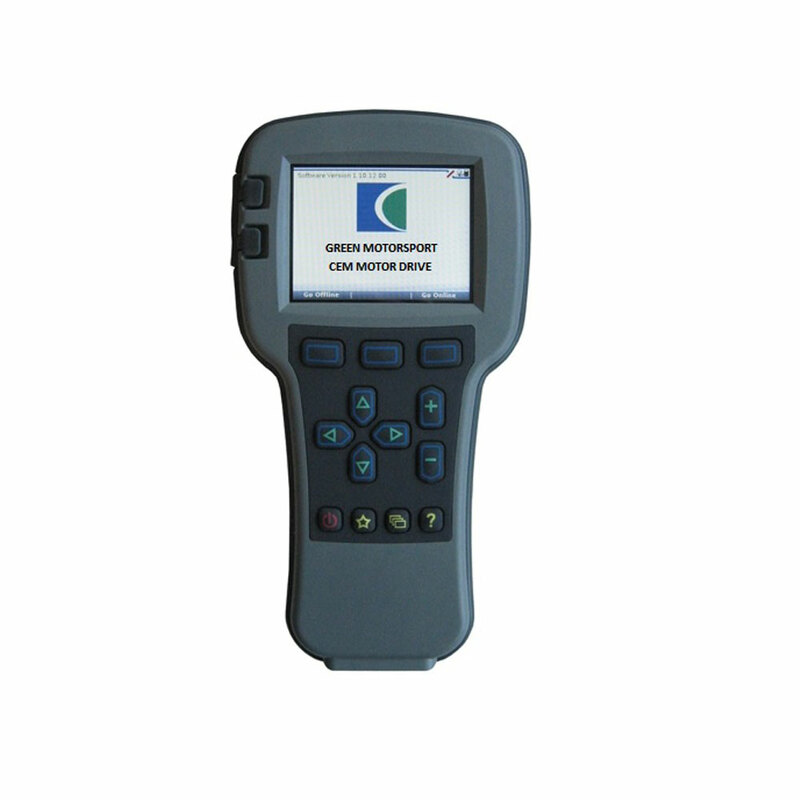 We could also help them to meet their targets for cutting carbon dioxide. 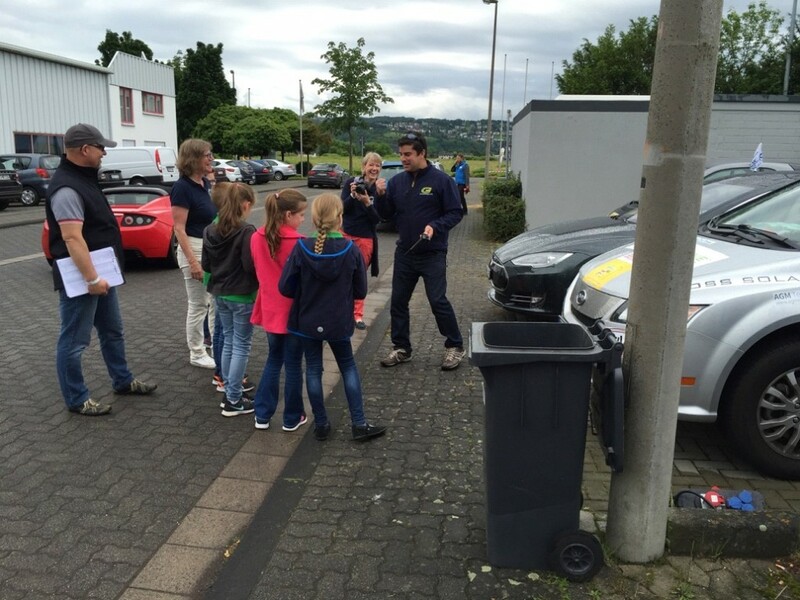 In the afternoon the WAVE again split into two streams, demonstrating our electric vehicles to children at schools in Worb and Konolfingen. The WAVE rejoined at Lausanne, a city in the French-speaking part of Switzerland, which is situated on the shores of Lake Geneva. We had an official reception followed by an excellent dinner and a tour of the City. We still had letters to collect from schoolchildren before our arrival later in the day at the United Nations in Geneva. 280 children greeted us in Le Sentier, which is one of the centres for making Swiss watches. We collected more letters from children in Bernex where we had an official City reception and our French speaking teams gave a presentation. 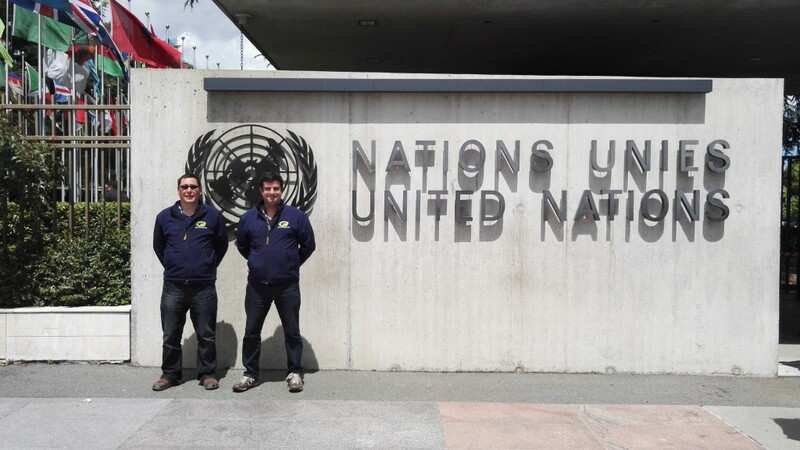 We were now very close to our final destination in Geneva, which has the headquarters of many of the agencies of the United Nations. Geneva does not have any particular “sister” tie with any city in the world. It declares itself related to the entire world. Geneva has one of the world’s oldest records of a plant’s reaction to climatic conditions. Since 1818, a particular chestnut tree has been used as the official “herald of the spring” in Geneva. The secretary of the Parliament of the Canton of Geneva observes the tree and notes the day of arrival of the first bud and issues a formal press release. Researchers have been interested to note that the first bud appears earlier and earlier in the year. During the first century, many dates were in March or April. In recent years, it has usually been in mid-February and sometimes even earlier. 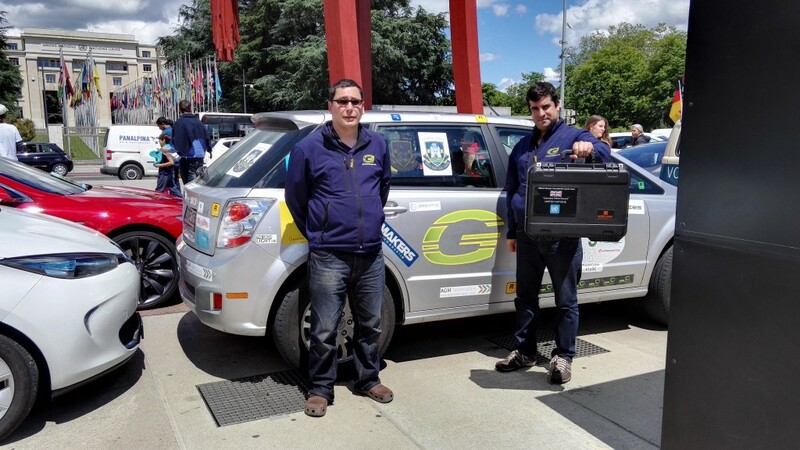 Gordon Foat (right) and Sebastian Barrett-James arrived in the Place des Nations in Geneva in the afternoon. All the participants in the WAVE lined up to form 1.5C to show our commitment to reducing the risk of severe climate change. The red arrow points towards team 3 Green MotorSport. 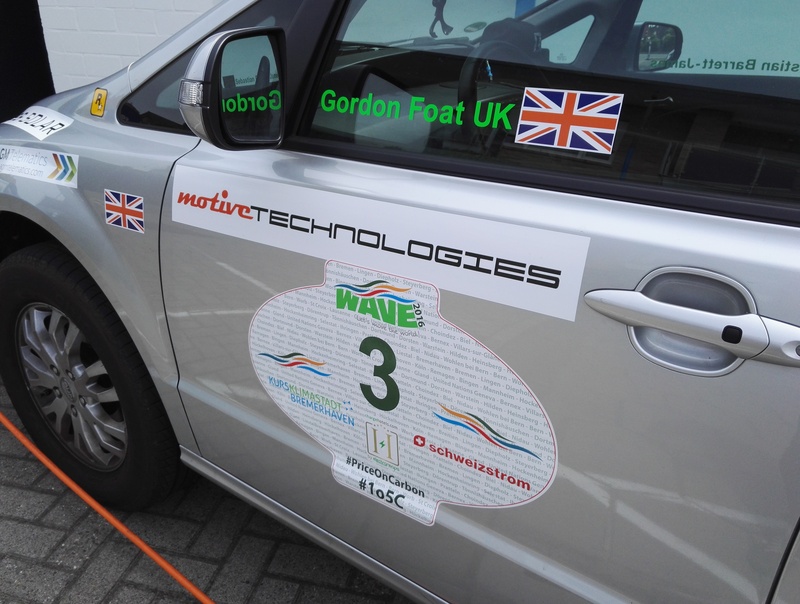 Gordon displayed the case of letters from school children from George Abbot School in Guildford Surrey which has been carried in his solar powered number 3 BYD electric vehicle. The children ask the United Nations to take stronger action to deal with climate change and avoid risks to their future. The team also had a periscope live feed channel. 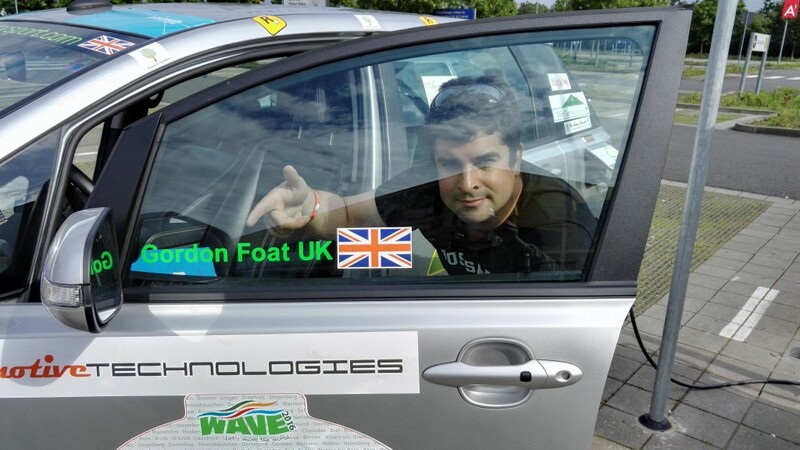 Search for Gordon Foat@greenmotorsport to see live feeds from WAVE 2016.